Recently one of my contract sites (where I work exclusively with children) asked me to provide them with some information in consideration of a story in their magazine. I always love the opportunity to talk about the work I do, and I thought I would share some of my responses here with you as well. 1. What is the role/purpose of the music therapy program –how do you adapt that role to the different age groups of patients? And to their different conditions? Music is an incredibly flexible tool that in the hands (or voice) of a music therapist can be melded into exactly what a patient needs in that moment. The needs of the patient may be for soothing and pain abatement – I can play a quiet simple chord progression and sing a simple melody that can lull a child in distress into a state of calm, even sleep. I have used repetitive drumming patterns to create a state of predictability upon which a teenager can express feelings of loneliness, fear, gratitude, or resiliency. I have worked with patients to play through their favorite songs, or create an original musical composition. When possible and appropriate, I like to record these into an audio file that the patient can then keep. Sometimes my goal for a child is to simply explore musical play – to be silly within the music and have a good time. This is a way to elevate their mood and improve their perception of their current situation. It also reminds the kids, especially those who are not musicians, that there are ways of having fun in life that they may not have discovered yet. This is essential for kids with new injuries or new limitations. Patients of all ages and ability levels can benefit from music therapy interventions. Adaptations based on a patient’s interests and their physical, cognitive, or musical abilities are made in the moment. I assess the level of functioning and the need for change through consultation with the staff and family members, as well as with the patient when that patient has a particular desire in mind. Being with a patient in the music together creates magical moments of connection and understanding, through which patients can meet and sometimes exceed their goals. My goals fall into the realm of psychosocial or developmental growth, pain reduction, or improvement of their physical or speech functioning. I use the motivating factors in music which are psychologically and neurologically hard wired, to achieve change in functioning. There in lies the difference between music therapy, and entertainment or eduction. 2. Give me an idea of the range – kinds of instruments, types of music? The types of music depend on the style that the patient prefers. Research (and common sense) shows that when a patient is introduced to their favorite type or style of music, they will be more engaged in the process. This requires a high level of versatility on the part any music therapist. The instruments we use are a combination of acoustic guitar, piano, electric keyboard, djembe, bells, and other hand-held percussion instruments. We can also use recorded music and all the tools accessible via the music applications on the web. Some favorites are musical instrument games and recording apps. 3. Is there a particular patient who especially benefited from music therapy that you remember? Tell me a little about that encounter? I remember one young woman in particular who was a poet. She was a quadriplegic aided by her sip/puff chair. We listened to music together over the course of a few weeks, talked about the lyrics, talked about her life and her goals. She played her favorite songs for me and I was able to emulate a similar sound on the guitar. She wrote a series of poems, and I helped her to form those lines into melodic phrases, a lot like her musical genre of choice. By the end of a few sessions together we recorded her song with her singing along. She thanked me many times for offering her the opportunity to express herself with such authenticity. Recently I met with a little girl who guided me at the piano through the scenes of her favorite movie. This movie was full of danger and toil, to which we played our “dangerous sounds” as well as our “happy music” when the princess triumphed over her oppressors. I asked her if she ever felt like that princess – she told me how she had fallen that day, but like the princess, she had to pick herself up and keep going. We explored and celebrated that success at the piano so she was ready for another day of challenging therapy. 4. 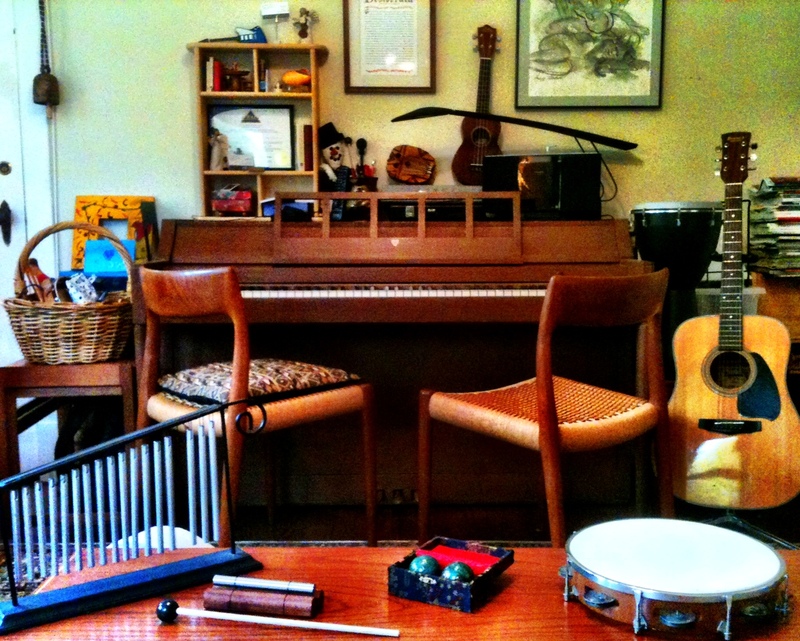 What are the credentials for a music therapist? As a board certified music therapist (MT-BC) I have both a bachelors and masters degree in music, majoring in music therapy. To become board certified, a 6 month full time clinical music therapy internship and comprehensive exam must be completed after completion of an approved/accredited bachelors degree. Continuing education must be fulfilled on a five-year cycle to maintain this certification. More information can be obtained at www.cbmt.org or www.musictherapy.org, the Certification Board for Music Therapists, and the American Music Therapy Association, respectively. A useful annotated bibliography can also be referenced at http://www.musictherapy.org/assets/1/7/bib_habilitation.pdf. Have a wonderful rest of November, continuing to be thankful and grateful for all that you have. Keep singing.